ISLAMABAD, Pakistan (CNN) -- A military offensive to rid Pakistan's northwest of al Qaeda and Taliban fighters has killed more than 1,000 militants since it began in full force earlier this month, the country's interior ministry said Sunday. 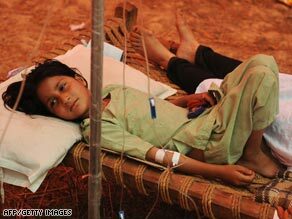 A Pakistani girl displaced by the offensive against the Taliban rests at a camp Saturday north of Islamabad. Officials also said that only 2 percent of the North West Frontier Province remains under Taliban control as a result of the operation. Both claims were difficult to verify independently. The government did not say whether the operation resulted in civilian casualties, or how many people it displaced. The United Nations said Saturday that more than a million people have been displaced as a result of the two-week-old offensive. The U.S-led coalition and NATO -- based in Afghanistan -- have long said Pakistan is not being proactive enough in battling militants who are launching attacks from Pakistan's swath of tribal areas along the border. Pakistan has denied the claim. But the country's military launched an intense operation to rout out militants from the area after Taliban fighters took control of a district just 60 miles from the capital, Islamabad.